This article is about the park in Chicago. For the neighborhood, see Lincoln Park, Chicago. For the rock band, see Linkin Park. For other uses, see Lincoln Park (disambiguation). Lincoln Park is a 1,208-acre (489-hectare) park situated along Lake Michigan on North Side in Chicago, Illinois. Named after US President Abraham Lincoln, it is the city's largest public park and stretches for seven miles (11 km) from Grand Avenue (500 N) on the south to near Ardmore Avenue (5800 N) on the north, just north of the Lake Shore Drive terminus at Hollywood Avenue. Several museums and a zoo are located between North Avenue (1600 N) and Diversey Parkway (2800 N) in the eponymous neighborhood. Further to the north, the park is characterized by parkland, beaches, recreational areas, nature reserves, and harbors. To the south, there is a more narrow strip of beaches east of Lake Shore Drive, almost to downtown. With 20 million visitors per year, Lincoln Park is the second-most-visited park in the United States. The park's recreational facilities include baseball/softball fields, basketball courts, soccer/football fields, tennis courts, volleyball courts, field houses, a target archery field, a skate park, a driving range, and a golf course. The park also features several harbors with boating facilities, as well as public beaches. There are landscaped gardens, public art, bird refuges, a zoo, the Lincoln Park Conservatory, the Chicago History Museum, the Peggy Notebaert Nature Museum, the Alfred Caldwell Lily Pool, and a theater on the lake with regular outdoor performances held during the summer. In 1860, Lake Park (earlier, Cemetery Park), the precursor of today's park, was established by the city on the lands just to the north of the city's burial ground. Five years later, on June 12, 1865, the park was renamed to honor the recently assassinated President Abraham Lincoln. Added to the National Register of Historic Places in 1994, part of the oldest section of today's Lincoln Park near North Avenue began its existence as the City Cemetery in 1843. This was subdivided into a Potter's Field, Catholic cemetery, Jewish cemetery, and the general City Cemetery. These cemeteries were the only cemeteries in the Chicago area until 1859. In 1852, David Kennison, who is said to have been born in 1736, died and was buried in City Cemetery. Another notable burial in the cemetery was Chicago Mayor James Curtiss, whose body was lost when the cemetery was added to the park. Throughout the late 1850s, there was discussion of closing the cemetery or abandoning it because of health concerns. In fall 1858, Dr. John H. Rauch MD suggested that the burial grounds were a health risk, which "might serve extremely well for plantations of grove and forest trees" that would be "useful and ornamental to the city." The idea was dropped during the Civil War, but revived by Dr. Rauch after the war ended. By 1864, the city council had decided to add all the 120-acre (0.49 km2) cemetery lands north of North Avenue to the park by relocating the graves. The cemetery sections south of North Avenue were also relocated but this land was left for residential development. To this day, the Couch mausoleum can still be seen as the most visible reminder of the history as a cemetery, standing amidst trees, behind the Chicago History Museum. Ira Couch, who is interred in the tomb, was one of Chicago's earliest innkeepers, opening the Tremont House in 1835. Couch is believed to not be the only person interred in the old burial ground in Lincoln Park. A plaque placed nearby states that "the remains of six Couch family members and one family friend are in the tomb." Partially due to the destruction of the Chicago Fire of burial markers, it was difficult to remove many of the remains. As recently as 1998, construction in the park has revealed more bodies left over from the nineteenth century. Another large and notable group of graves relocated from the site of today's Lincoln Park were those of approximately 4,000 Confederate prisoners of war who died at Camp Douglas. Many prisoners perished between 1862 and 1865 as a result of the poor condition they were in when taken on the battlefield, or of disease and privation existing at the Federal prison. Although the camp was located south of downtown Chicago, near the stockyards, the remains were originally interred at the site of today's Lincoln Park. Today, their gravesites may be found at Oak Woods Cemetery in the southern part of Chicago. A one-acre (4,000 m²) mass grave and a monument erected by Southerners and Chicago friends in 1895 memorializes these Southerners whose earthly remnants remain in the North. Author George Levy believes that remains of many of the Confederate prisoners are still to be found beneath what are currently baseball fields, the former site of the potter's field. An estimated 35,000 people total were buried in the park. From the 1860s through the 1950s the park expanded south and then north along seven miles (11 km) of Chicago's Lakefront. (See reference notes 1, 2 and 3). The establishment of public parkland along all of Chicago's Lakefront was a central tennet of the 1909 Burnham Plan for the development of Chicago. From 1912 until 1991, the park contained the Lincoln Park Gun Club. Another aspect of park history were the Young Lords Lincoln Park neighborhood sit ins and take-overs of institutions under the leadership of Jose Cha Cha Jimenez, protesting the displacement of Latinos by Mayor Richard J. Daley's urban renewal policies. It was also the scene of violent events that took place during the 1968 Democratic National Convention. These events transpired around the convention center, Grant Park, Old Town, and the park. I pointed out that it was in the best interests of the City to have us in Lincoln Park ten miles (16 km) away from the Convention hall. I said we had no intention of marching on the Convention hall, that I didn't particularly think that politics in America could be changed by marches and rallies, that what we were presenting was an alternative life style, and we hoped that people of Chicago would come up, and mingle in Lincoln Park and see what we were about. The Alfred Caldwell Lily Pool in Lincoln Park is a National Historic Landmark listing. Lincoln Park is well known for the Lincoln Park Zoo, a free zoo that is open year-round. Lincoln Park Zoo is home to a wide variety of animals. It includes big cats, penguins, gorillas, reptiles, monkeys, and other species totaling to nearly 1,250 animals. Two sections of Lincoln Park Zoo have been set aside for children. The partially indoor Pritzker Family Children's Zoo includes habitats of various North American wildlife. The Farm-in-the-Zoo is a working reproduction of a Midwestern farm containing horses and livestock such as pigs, cows, and sheep. At the Farm-in-the-Zoo, children can feed and interact with the animals and view live demonstrations of farm work such as the milking of cows. In 2010, the Zoo transformed the South Pond, to create a wildlife marsh habitat, with a Nature Boardwalk. The Lincoln Park Conservatory offers year-round displays of plants from many different climates around the world. Today's conservatory was built in stages from 1890 to 1895. It consists of a vestibule, four display halls and fifteen propagating and growing houses. The vestibule and Palm House were built and opened to the public in 1892 and contain giant palms and rubber trees, including a 15 m (50 ft) fiddle-leaf rubber tree planted in 1891. In the Palm House, one can also find Garden Figure, a sculpture by Frederick Hibbard. The Fern Room or Fernery was opened in 1895. It contains plants of the forest floor, primarily a vast collection of ferns. The Tropical Room was originally called the stove house. Opened in 1895, it contained an assortment of tropical plants suspended from bark-covered walls. It is now called the Orchid Room and has a collection of approximately 25,000 natural species. The Display House is used for seasonal flower and plant exhibits. A docent program run by the Chicago Park District and Lincoln Park Conservancy provides free tours of the Conservatory and its outdoor gardens from 1-4 p.m. on Fridays, Saturdays, and Sundays and from 9 to Noon on Saturdays. Located on Fullerton Parkway between Stockton and Cannon Drives, the Alfred Caldwell Lily Pool is an historic example of Prairie School landscape architecture. The Lily Pool was listed on the National Register of Historic Places and as a National Historic Landmark on February 17, 2006. The Lily Pool had originally been built to cultivate tropical water lilies in 1889. In the 1930s, the Works Progress Administration hired landscape architect Alfred Caldwell to redesign the pool in the Prairie School style. From 1998 to 2002, the Lily Pool underwent an extensive restoration by the Lincoln Park Conservancy and the Chicago Park District, which earned the site its historic designations, and renamed the site after Alfred Caldwell. The Lily Pool is open seasonally from mid-April to mid-November from 7:30 a.m. to the earlier of dusk or 7:30 p.m. every day. A docent program run by the Chicago Park District and Lincoln Park Conservancy offers free tours from 1-4 p.m. on Fridays, Saturdays, and Sundays, and from 9 - Noon on Saturdays during operating season. First established in 1857 as the Chicago Academy of Sciences and now occupying its new facility since 1999, as the Nature Museum, this museum descends from the Park District's first museum in the parks. The museum's exhibits include displays about the ecological history of the Illinois region, a live butterfly house, and a green home demonstration. The butterfly house features over 200 species of exotic butterflies. The museum also offers educational programs for adults and children. Located at Clark Street and North Avenue, the Chicago History Museum (formerly the Chicago Historical Society) is dedicated to Chicago's human history. Perhaps among its most well-known possessions are Abraham Lincoln's deathbed and several furniture pieces from the room where he died in the Petersen House in Washington, D.C., as well as clothing he and wife Mary Todd Lincoln wore the evening of his assassination. The museum also houses Chicago's most important collection of materials related to local history from the Great Chicago Fire to the Young Lords in Lincoln Park. In addition to the exhibits, the museum continues to house an extensive research library which includes books and other published materials, manuscripts, paintings, sculptures, and photos. Lincoln Park runs from north to south through five Chicago community areas: Edgewater, Uptown, Lake View, Lincoln Park, and Near North. Along its seven-mile (11 km) stretch, Lincoln Park has many specialized spaces for recreational activities. The Park contains playgrounds; tennis and basketball courts, boating facilities; beaches; field and beach houses; running and bike paths; playing fields and pitches for football, rugby, baseball, softball, cricket, soccer, volleyball, archery; a golf course; a driving range; and areas for horseback riding. There are seven public beaches for swimming, sunbathing, and beach volleyball along the park's 7-mile shoreline that are guarded during the summer months. The beaches from north to south are, Thorndale, Hollywood, and Foster in Edgewater; Montrose in Uptown; North Avenue in Lincoln Park; and Oak Street and Ohio in Near North. The first City of Chicago public beach, North Avenue Beach, opened in Lincoln Park in 1895. The Waveland Avenue Golf Course (now, Sydney R Marovitz) in the Uptown and Lakeview, Chicago neighborhoods section of the park provides a lakeside setting for the game. (41°57′9″N 87°38′27.4″W﻿ / ﻿41.95250°N 87.640944°W﻿ / 41.95250; -87.640944) Known for its challenging narrow fairways, it offers nine tees on a par-36 course. Further south, inland of Lakeshore Drive, is a driving range and miniature golf course. There are three harbors in the Park providing marina and docking facilities for boaters: north to south, they are Montrose in Uptown, Lakeview's Belmont Harbor, and Diversey Harbor in the Lakeview and the Lincoln Park Neighborhoods. Montrose Harbor provides 630 dock facilities and is home to the Chicago Corinthian Yacht Club. Belmont Harbor provides 730 moorings, a fuel dock and a ship store. The Chicago Yacht Club has a Belmont station and the Belmont Yacht Club is located here. Diversey Harbor has 714 moorings and the Diversey Yacht Club provides a fueling dock. There is also a public launch at Diversey and the park also has rowing, sculling, and crewing channels. The Chicago Lakefront Trail (abbreviated as LFT) is an 18-mile multi-use path in Chicago along the coast of Lake Michigan. It is popular with cyclists and joggers. It is designed to promote bicycle commuting. From north to south, it runs through Lincoln Park, Grant Park, Burnham Park and Jackson Park. The North Pond Nature Sanctuary (41°55′42.12″N 87°38′15.66″W﻿ / ﻿41.9283667°N 87.6376833°W﻿ / 41.9283667; -87.6376833﻿ (North Pond)), located between Fullerton, Diversey, Stockton and Cannon, is a ten-acre pond that has become an important wildlife area. Historically the site was a dune, then a dumping ground, and an ornamental pond; it was converted in 1999-2000 into a natural area with a littoral zone that greatly improved the water quality by re-establishing native Midwestern ecology. The upland restoration of prairie, savanna, and woodland plants has included only top quality native species such as little bluestem, sky-blue aster, nodding wild onion, side-oats grama, butterfly weed, purple prairie clover, rough blazing star, wild quinine, prairie phlox, coneflowers, false dragonhead, northern prairie dropseed, showy goldenrod, rattlesnake master, shooting star, and wild bergamot. The North Pond Nature Sanctuary is notable as the site where Mayor Richard M. Daley and the US Fish and Wildlife Service signed an Urban Conservation Treaty for Migratory Birds in April 2004, making the city eligible for federal funds to restore habitat for the lakefront migratory pathway for birds. Restoration with native plants has drawn a great diversity of wildlife to this urban pond including many species of birds, turtles, frogs, and even a few beavers. Great blue herons, black-crowned night herons, green herons, mallards, wood ducks, song sparrows and woodpeckers can regularly be spotted at the North Pond Nature Sanctuary. Further north in the park, in the Lake View neighborhood (3600 N), there is the Bill Jarvis Migratory Bird Sanctuary (41°56′54.64″N 87°38′26.47″W﻿ / ﻿41.9485111°N 87.6406861°W﻿ / 41.9485111; -87.6406861; formerly, Lincoln Park Addison Migratory Bird Sanctuary). First landscaped and constructed with limited public access in the 1920s, under the leadership of the Chicago Academy of Sciences, its spring is supplied with city water to mimic a natural lake marsh environment, with attendant forest and meadow environments. Most of its 7-acre (2.8 ha) area is entirely fenced around to preserve the habitat from human encroachment. Instead, a nature trail and a viewing platform are at its surrounding perimeter. During the 1940s, its Park District caretakers lost funding and the site was padlocked. In 1968, the entire site was almost bulldozed for golf course development but its Lake View neighbors, including Bill Jarvis, led a successful campaign to save and restore it. Today it hosts more than 150 species of birds, including six species of herons, like the black crowned night heron; wood ducks; woodcock; hawks; yellow-billed cuckoos; hummingbirds; thrushes; vireos; 34 species of warblers; and 18 native species of sparrows. In addition, small mammals such as rabbit, opossum, raccoon, and occasionally fox and coyote make their home there. In the Uptown neighborhood (4400 N;41°57′47.95″N 87°38′1.75″W﻿ / ﻿41.9633194°N 87.6338194°W﻿ / 41.9633194; -87.6338194), there is the 15-acre (6.1 ha) Montrose Point Bird Sanctuary (including "The Magic Hedge"). During the Cold War, Montrose point, which juts out into Lake Michigan, was used by the United States Army as a Nike missile base. The Army camouflaged their missile launchers and barracks behind honeysuckle hedges. When the Army left in the 1970s, bird watchers noticed how the honeysuckle attracted birds. They successfully lobbied the park district for a new preserve. After extensive replanting, the site supports woodland, tall prairie, and lake dune habitat that annually attracts tens of thousands of migratory birds of more than 300 different species. Lincoln Park is known for its statuary. Walking through the park, one sees many of Chicago's great works of art. There is a famous statue of Abraham Lincoln in Lincoln Park by Augustus Saint-Gaudens, the same sculptor who created the Lincoln statue in Grant Park. Replicas of Lincoln Park's "Standing Lincoln" can be found at Lincoln's tomb, Springfield and in Parliament Square, London. The statue is located at Dearborn Street and North Avenue. It was fully restored in 1989 by the Lincoln Park Conservancy's Adopt-A-Monument Program, and 8,200 s.f. of formal gardens were added in front of the monument. The only other person immortalized by statues in both Grant and Lincoln parks is Alexander Hamilton; the Lincoln Park statue was sculpted by John Angel. Just as there is an Abraham Lincoln statue in Grant Park, there is a massive memorial to Ulysses S. Grant in Lincoln Park overlooking Cannon Drive. The sculpture was created in 1891 by Louis Rebisso. The statue of Hans Christian Andersen by Johannes Gelert (1896) on Stockton Drive near Webster Avenue provides a tribute to the Danish storyteller. The Eugene Field Memorial (1922) designed by Edward McCartan remembers the Chicago Daily News columnist and poet who wrote "Little Boy Blue" and "Winken, Blinken, and Nod." William Ordway Partridge's statue of William Shakespeare (1894) provides a third great story-teller in Lincoln Park. This seated Shakespeare provides a lap for children to climb onto. A bust of Sir Georg Solti, the former conductor of the Chicago Symphony Orchestra, was also situated in the Lincoln Park Conservatory's formal garden until its relocation to Grant Park in October, 2006. Statues honoring the German poets Johann Wolfgang von Goethe and Friedrich Schiller can also be found in Lincoln Park. The large Goethe statue is located near Diversey Parkway and Stockton Drive. The smaller Schiller statue is located near the western entrance to the zoo. At Addison Street stands a 40-foot (12-meter) totem pole depicting Kwanusila the Thunderbird. Finally, a statue of John Peter Altgeld (1915), the nineteenth-century Illinois Governor who pardoned the Haymarket Square rioters, can be seen just south of Diversey. This statue was created by Gutzon Borglum and unveiled on September 6 (Labor Day), 1915. Borglum went on to create the Mount Rushmore National Memorial. 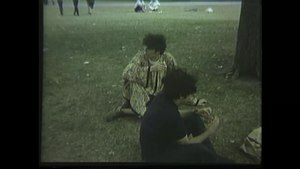 The 1980 film My Bodyguard contains several scenes filmed in Lincoln Park. Phil Ochs' song "William Butler Yeats Visits Lincoln Park and Escapes Unscathed" featured on Rehearsals for Retirement is about his experience walking through the park during the 1968 Democratic National Convention protests. In 2004 the Lincoln Park Lagooners were inducted into the Chicago Gay and Lesbian Hall of Fame. ^ "Lincoln Park History". Parks & Facilities. Chicago Park District. Archived from the original on June 21, 2009. Retrieved June 21, 2009. ^ "City Park Facts" (PDF). The Trust for Public Land, Center for City Park Excellence. June 2010. Archived from the original (PDF) on December 31, 2010. Retrieved January 3, 2011. p. 25. ^ "Hidden Truth:Chicago City Cemetery". Northwestern University. Retrieved May 15, 2011. ^ "National Register of Historic Places – Illinois (IL), Cook County". Retrieved August 14, 2009. ^ Bannos, Pamela (2012). "Hidden truths: Visualizing the City Cemetery". The Chicago Cemetery & Lincoln Park. Northwestern University. Retrieved November 15, 2012. ^ Kestenbaum, Lawrence (1996–2010). "Cook County, Illinois". The Political Graveyard. Archived from the original on March 26, 2011. Retrieved January 25, 2011. ^ Bannos, Pamela. "Hidden Truths: Couch Tomb". Northwestern University. Retrieved September 23, 2011. ^ "Hidden Truth: The Chicago City Cemetery and Lincoln Park". Northwestern University. Retrieved July 7, 2009. ^ "Hidden Truth: Potter's Field". Retrieved July 7, 2009. ^ Amer, Robin (November 10, 2012). "The secret history of Lincoln Park's cemetery". WBEZ. Retrieved July 27, 2017. ^ "Lincoln Park Zoo Timeline". lpzoo.org. Archived from the original on December 20, 2015. Retrieved November 11, 2015. ^ "Lincoln Park Conservatory". Chicago Park District. Retrieved July 27, 2017. ^ "Lincoln Park Lily Pool". National Park Service. Archived from the original on January 3, 2008. Retrieved May 10, 2007. ^ "Lincoln Park Alfred Caldwell Lily Pool". Chicago Park District. 2006. Archived from the original on May 5, 2007. Retrieved May 10, 2007. ^ Mark Rosenthal, et al., Ark in the Park (University of Illinois, 2003) p. 66. ^ Donna Vickroy. "Notebaert Nature Museum evolves". Daily Southtown. October 1, 2004. ^ "Peggy Notabeart Nature Museum". Chicago Tribune. Retrieved May 15, 2011. ^ "The Bloody Evidence". Chicago History Museum. Archived from the original on October 28, 2010. Retrieved October 14, 2010. ^ "Golf Courses: Sydney R. Marovitz Golf Course". Chicago Park District. Retrieved November 11, 2015. ^ "Home - Chicago Harbors". Chicago Harbors. Retrieved November 11, 2015. ^ "Montrose Harbor Information". Archived from the original on July 19, 2011. Retrieved July 27, 2017. ^ Chicago Park District (February 2002). "Nature Areas: Lincoln Park Pond". Archived from the original on December 8, 2004. Retrieved December 6, 2009. ^ Boehm, Kiersten (January 15, 2010). "Save the Lincoln Park beaver!". LIncoln Park Now. Retrieved July 27, 2017. ^ Holingue, Scott (January 1, 1994). Tales from an Urban Wilderness: Wildlife's Struggle for Survival in a Park Where City & Wilderness Meet. Chicago: Chicago Historical Bookworks. p. 140. ISBN 0-924772-25-5. ^ "Lincoln Park Addison Migratory Bird Sanctuary". Chicago Park District. Archived from the original on March 20, 2006. Retrieved May 15, 2011. ^ a b "Sustainable Development" (PDF). Publications. City of Chicago. 2005. ^ a b "Montrose Point Bird Sanctuary ("The Magic Hedge")". Chicago Park District. Archived from the original on March 20, 2006. Retrieved May 15, 2011. ^ "Bird Watching". Chicago Magazine. Retrieved May 15, 2011. ^ "Birding Montrose Point Bird Watching Sanctuary Magic Hedge Chicago Illinois". Audubon Society, Lake Cook Chapter. ^ Bean, Andrew (December 1995). "The Statues of Chicago's Lincoln Park". Illinois History. Archived from the original on June 16, 2011. Retrieved May 15, 2011. ^ "John Peter Altgeld Monument" (PDF). Chicago Public Art. September 9, 2013. Archived from the original (PDF) on May 30, 2015. ^ "Chicago Gay and Lesbian Hall of Fame". glhalloffame.org. Archived from the original on October 17, 2015. Retrieved November 11, 2015. Wikimedia Commons has media related to Lincoln Park (Chicago). Historic American Engineering Record (HAER) No. IL-155, "Passerelle in Lincoln Park"